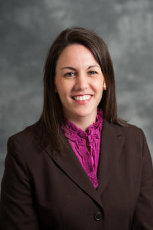 Assistant Professor in the College of Law Abbie DeBlasis was recently selected to participate in the Tennessee Bar Association’s (TBA) 2017 Leadership Law program. One of twelve Nashville attorneys selected, DeBlasis will join a group of 35 other attorneys from across the state to participate in the program’s 14th year. The class will meet for its first session in January and spend the next six months learning about leadership in the legal profession, issues in the courts, policymaking in state government and the importance of community service. TBA is the largest professional association in Tennessee with more than 13,000 members. Founded in 1881, TBA provides opportunities for continuing legal education, professional development and public service. TBA’s dedication to serving the state’s legal community is evidenced by its membership roll, which represents the entire spectrum of legal practice: plaintiff and defense lawyers, corporate counsel, judges, prosecutors, public defenders, government lawyers and legal services attorneys.